In a serene, light-filled apartment just off one of the busiest thoroughfares of the 16th arrondissement of Paris, Jumana El Husseini recreates in her paintings the images of the Palestine of her girlhood. Paint brushes and palette knives are arranged like a still-life in a copper bowl on a contempoarary table, but large wooden mirrors inlaid with shell and delicate pieces of pink Syrian glass echo her Middle Eastern origins. In the courtyard outside, the sound of chirping Parisian birds triggers her memories of summers in Jericho and walks on the Mount of Olives. El Husseini was reared in her grandfather's home, in the first house to be built outside the old walls of Jerusalem. For her, exile began unexpectedly: A 1947 Christmas visit to a married sister in Beirut was protracted by the outbreak of war, and her stay there lengthened until she married and had a family of her own. Separated from Jerusalem, she accepted Beirut as her home away from home. A few chance art courses opened a new world for El Husseini. In art, she explains, she discovered a salve for the loss of her homeland. "I found Palestine again on canvas. I live my youth, my early days there - all the memories, the birds, the flowers, the butterflies, the greenery, the Dead Sea, the windows, the doors, the skies of Palestine. This is where I found myself." 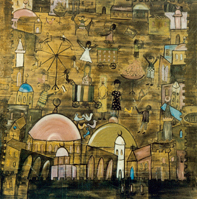 Painting for herself initially, and then exhibiting in Beirut, El Husseini had her first international exhibition in London in 1965. 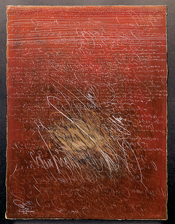 Since then, her work has been shown throughout the Arab world, in Europe, the United States, and in Japan. Today, she is a well-established and successful professional whose paintings are in collections around the world. Like turning the pages of an autobiography, El Husseini shows a visitor painting after painting, each one representing a step in her artistic and emotional odyssey, each one capturing aspects of the Palestine she still misses daily, still returns to daily in her imagination. "Palestine is my inspiration," she says, "whatever the happiness, the sadness, the strength, or the misery." Her first paintings were in squares with wide, frame-like borders - "frames for memories," she called them. Inside the borders, like scenes glimpsed through a window, El Husseini, working directly on the surface, captured her personal memories: architectural elements from the house of Jerusalem, flowers, trees, minarets, and faces. Each element is realized with icon-like reverence; simplified forms combine with bright colors frozen in timeless, stylized settings. Traditional motifs assume a lyricism that evokes a mystical, almost mythical past. 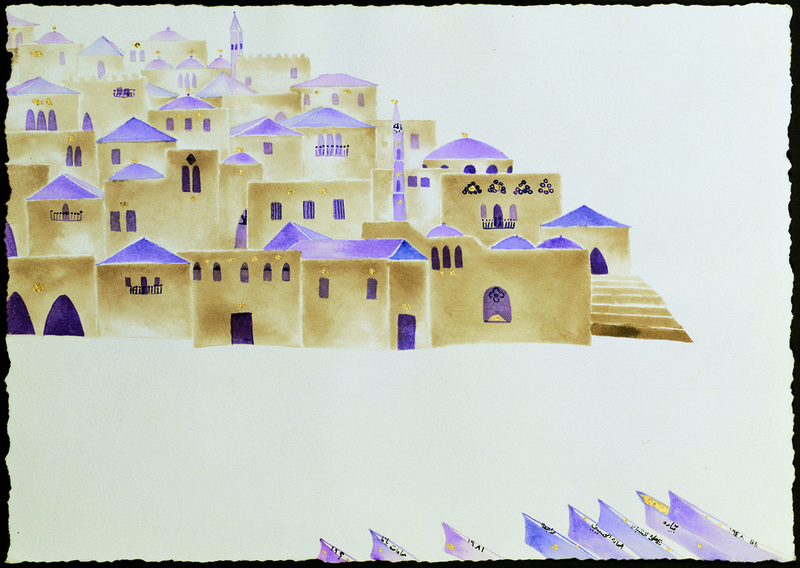 A return trip to Jerusalem in 1967 prompted El Husseini to begin sketching the city directly, rather than relying for inspiration on her storehouse of memories. From that time on she took a sketch pad along wherever she went on her visits, recording old architectural details as new construction began to change the face of the cities, documenting the customs and the folklore. "I felt I was preserving a way of life that was threatened," she says. 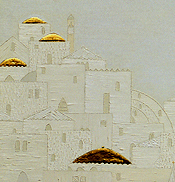 From these sketches, her distinctive paintings of cities emerged: Jerusalem with its towering domes and minarets, Jericho with its mixture of wooden and mud houses and tropical vegetation, Jaffa's domes in a symbolic orange hue, Haifa's unique windows, the colored tiles of Madina or the old wood houses of Makkah. Using palette knives and other implements, or applying paint directly from the tube and mixing in sand or other material, El Husseini developed textured surfaces in her paintings, the impasto creating three-dimensional effects often highlighted with gold leaf or silver. Sometimes, textured passages are juxtaposed with smooth, brushless areas for greater effect. Some of the most beautiful and evocative city paintings are symphonies of white on white, where the texture and the gold leaf create subtle interplays of light and shadow. "Jerusalem" (1980) and other paintings in this series show her evolution from a busy, detailed style to simpler, more painterly renditions. The effect is to imbue the subjects with a serene, spiritual quality that brings to mind Wordsworth's description of his poetry as "emotion recollected in tranquility." Although she says her code of symbolism is a personal one, El Husseini's iconography is never didactic and always subordinated to her painterly concerns. Horses, with their strength and homing instincts, are especially symbolic: "Wherever you put him, he goes back home; he smells the land." Butterflies are uncaged and free, like the birds of Jericho; a tiger in a cactus corral - the traditional way of containing Palestinian livestock - symbolizes proud spirits trapped and constrained; pomegranates are the wedding symbol of good luck and fertility. 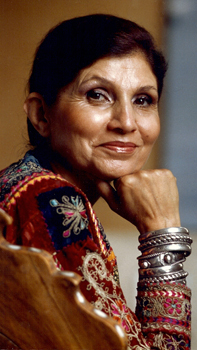 Deeply sensitive to her environment and to political events in the Middle East, El Husseini has found that the quantum changes in her style are often triggered by current events. 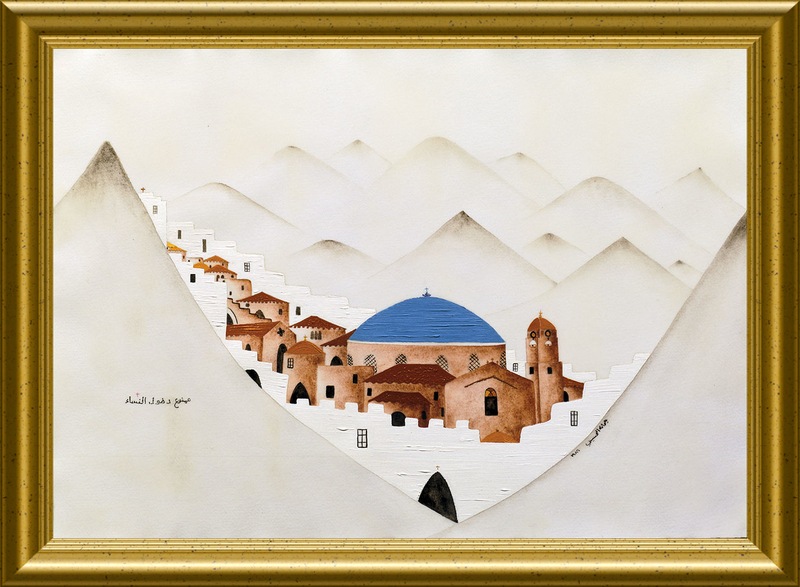 When the civil war broke out in Beirut in 1975, she was too upset to paint. For months, she embroidered instead, weaving family history and symbols into shawls in the rich jewel tones of traditional Palestinian costumes. The oak tree from her home in Jerusalem is there, almost 2000 years old, alongside cypresses, wheat, butterflies, flowers and traditional geometric designs. The embroideries, with their exquisitely rendered scripts of names and events in the borders, are portable, wearable records of a way of life that is gone. 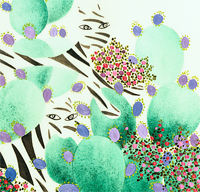 When canvas and oil paint became hard to get, she switched to watercolors. Accidentally tearing the paper on which she was working one day, she repaired it with glue and in the process began to experiment with the use of both watercolor and oil - separated by a layer of glue - in the one painting. The glue gives the effect of a way of life preserved, museum-like, under glass. 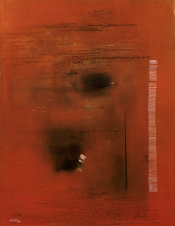 In all El Husseini's paintings, color expresses a wide emotional range. Ironically, though, her newest work, in which she is exploring the possibilities of abstraction for the first time, is predominantly black. On closer inspection, however, variations of tone and amoebic shapes in different colors are visible. Again, the change of style was prompted by political events. "The revolt of the children made me drop everything and become completely abstract," she says. "The paintings are black, but I am in my happiest period. I feel there is a resurgence in everything I am doing now." In the maelstrom of the Parisian art world, with its numerous galleries and blockbuster exhibitions, Jumana El Husseini charts a quiet, dedicated path in her commitment to her memories and her art. Like the small voices of the birds above the din of the traffic, she makes a strong, distinctive statement that reaches beyond personal emblems to a shared visual language.